India is a secular country with people of various culture, religion and tradition residing together with peace and harmony. This diversity of India makes it one of the most popular countries in the world and also a place of attraction for foreign tourists. India is full of colors as every culture has their own identity, own ways of living, dressing eating and many more. This means that they also have different dresses for wedding as well. Since India is also popular for its beautiful ladies and their beautiful attires such as bridal lehenga, it is quite evident from the fact that the brides will also look fabulous is their traditional wedding dresses and stealing hearts of millions. 1. West Bengal: A Bengali bride is always seen flaunting a red, pink or maroon Banarasi silk saree with a traditional head gear called chuda which is either made of flowers like rose and rajnigandha or of thermocol. The forehead makeup is the most beautiful thing which is made of sandalwood paste. Alta is put on the feet of the bride. 2. Kerala: A traditional Malayali bride looks best in a traditional bright colored Kanchipuram or Kanjeevaram silk saree decorated with embroidery, zari or zardosi. Lots of gold jewelryis also worn by the bride to complete the look with kumkum and vibhuti. 3. Punjab: For a Punjabi bride, lehenga choli or salwar suit of red color is a perfect outfit. The red dupatta on the head is the most essential thing about the wedding along with chuda which are bangles of red, pink or beige color that distinguishes the bride from others. 4. Manipur: A Manipuri bride wears a skirt called Raslila, Pindhan a black sarong and a blouse called Silum matching with the skirt. 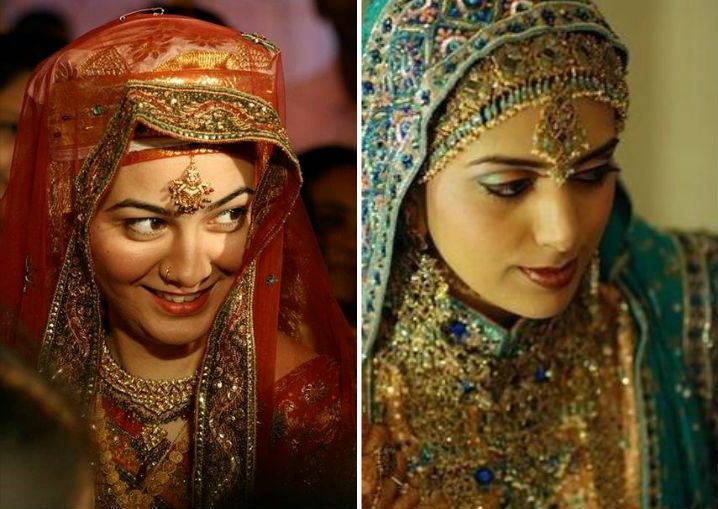 The bride is also seen wearing different jewelries which is because Manipur is also called as the Land of Jewels. 5. 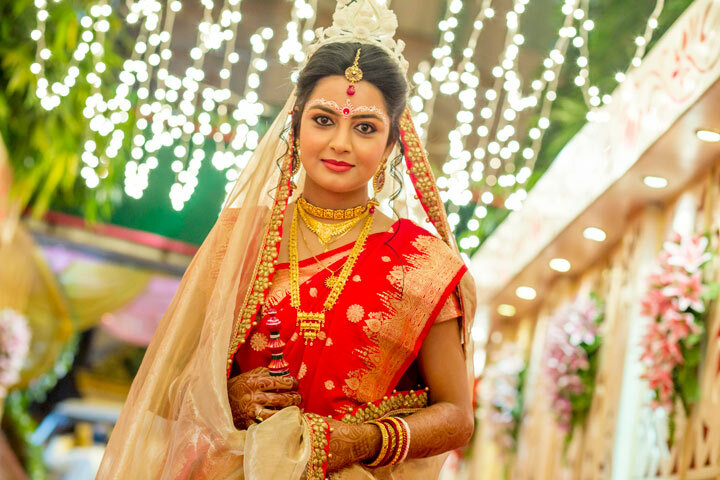 Assam: An Assamese bride is seen wearing a white and golden mekhla chadar with plain tints of red with simple to heavy jewelries depending on the wish of the bride. After marriage jewelries are similar to that of a Bengali bride. 6. 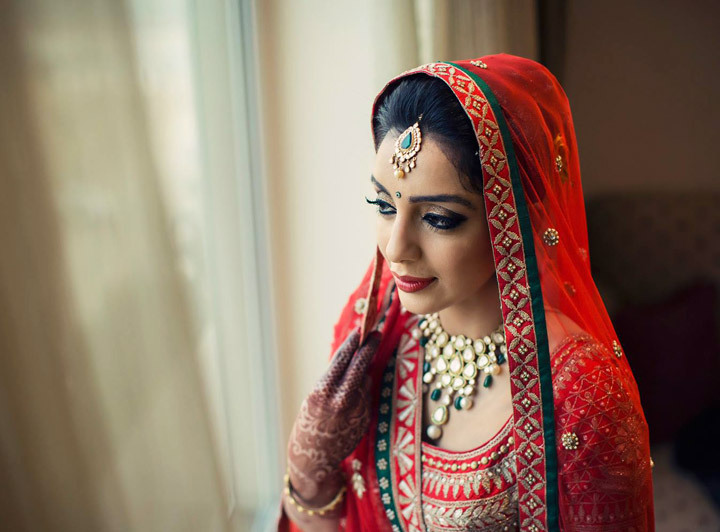 Maharashtra: A Marathi bride can be easily distinguished from brides of other states by her traditional crescent moon shaped nath or nose ring and toe ring along with a headband called mundavalya which is worn by both the bride and the groom. The bride wears a bright colored paithani saree such as maroon, green, sky blue or orange. 7. Gujarat: Traditional Gujarati saree called as Gharchola of white color with red designs is chosen for a Gujarati bride. The draping of the saree is also done in a different way that is on the front side along with lots of jewelries and ornaments. 8. Tamil Nadu: Koorai sarees with lots of red hues with floral motifs and golden brocades is the best suited bridal wear for a Tamil bride. Jewelry include layered necklace, maangtika, baaju band, shoulder harness and many more. 9. Kashmir: A Kashmiri bride looks the most beautiful in a salwar suitor lehenga choli along with a kalpush or a head gear, pheran and traditional jewelries. 10. Bihar: Bihari brides usually choose yellow or red sarees with sufficient gold jewelries, yellow colored odhni to cover the head. 11. 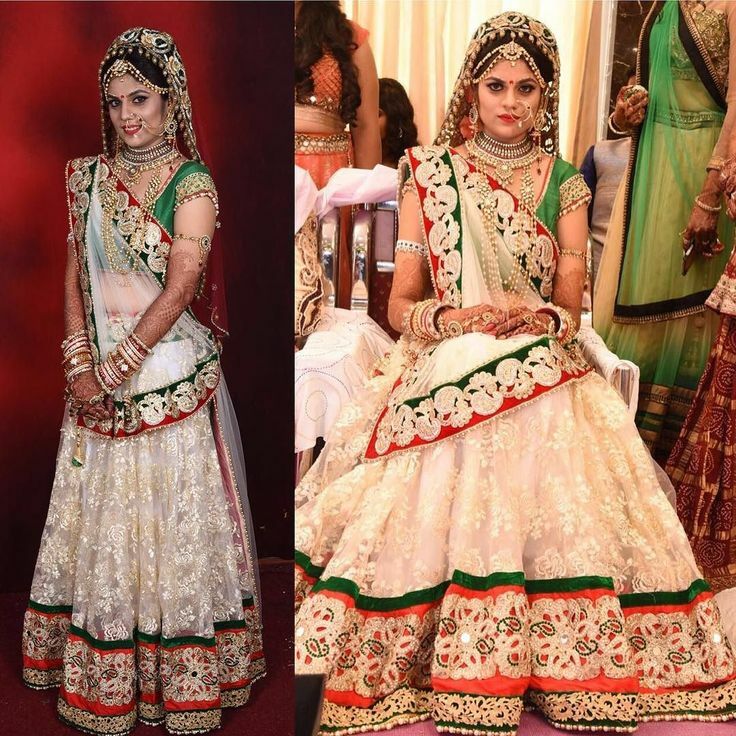 Rajasthan: A heavy ghagra choli is the perfect bridal wear for a Rajasthani bride designed with gotta patti and zari. Jewelry includes rakhri, a circular maang tika and choker called as Aad. 12. Andhra Pradesh: A telugu bride wears a rich saree in bright color along with lots of gold ornaments and flowers adorning the hair. With so many different states and different cultures India is a place full of diversity. These differences make India different in the entire world. Indian wedding lehenga is also very common these days as many of the brides go for that.